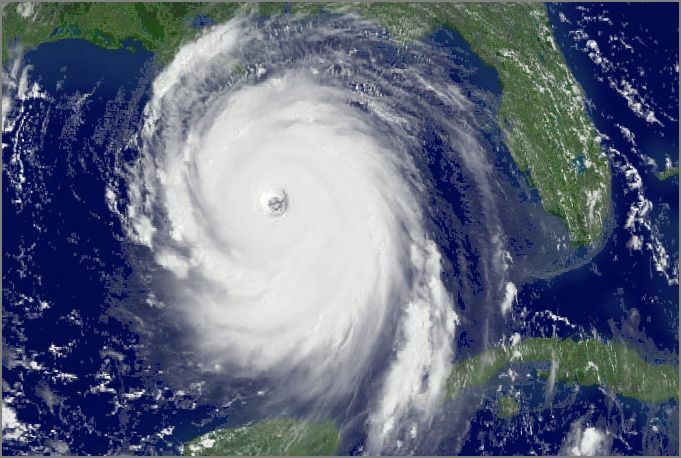 Even though Gustav doesn’t appear to be quite as scary from space, the weather guys are predicting a similar strength and location to what happened 3 years ago (almost exactly 3 years, actually). I tried to find two images for comparison that represented the same vantage point. 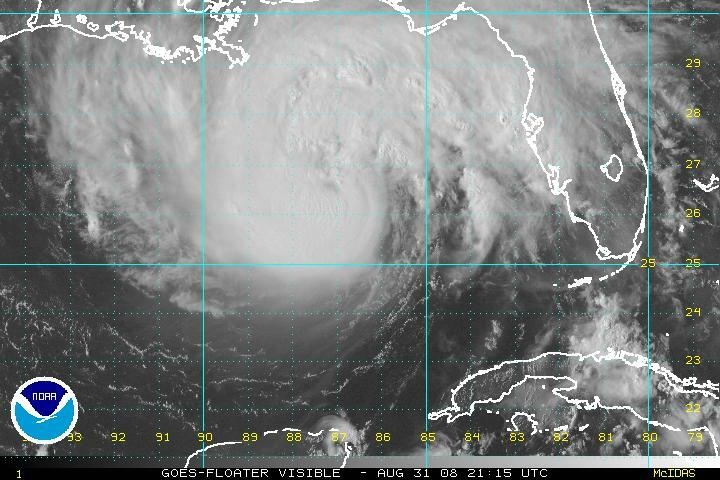 Maybe it isn’t the size that makes Katrina look worse, rather that tightly defined eye wall. I hope everyone makes it out of there OK.
As the overdose of punditry over the selection of Sarah Palin as McCain’s running mate overwhelms casual readers everywhere, I thought I might as well add my own take on the matter. And if there is a single word that immediately comes to mind, it would be “pander”. I mean, is there really any other way to look at it? I’m no political scientist, but it seems to me that there are three rationales at work when a presidential candidate selects a running mate, and it would come down to a) who helps one’s chances getting elected, b) who would help one govern effectively, and c) who would be a logical successor to the presidency. On the surface the selection of Sarah Palin would satisfy (a), and that’s about it. -Well, first, you’ve got a presidential candidate that, throughout the primaries, was derided by the Rush’s and Hannity’s of the world as not being conservative enough. So, check the box for the conservative pander, since it would appear that Palin is solidly on that side of the fence. -Second, as I’ve pointed out with a few posts on the PUMA’s, there is a certain percentage of the female voting block that would be inclined to fill the feminist gap now that Hillary is out of the race, and/or is bitter, having viewed the campaign (or the media coverage thereof) as sexist, or whatever. For voters out there who wanted to cast their vote for a woman, Palin picks up the baton from Clinton. So, check the box for the female pander. Liking. “People prefer to say yes to individuals they know and like,” Cialdini says. In negotiations and sales situations, one can influence the outcome by developing a kinship with prospective clients or being familiar to them. Being physically attractive is also a big advantage. Research shows that people attribute talent, kindness, honesty, and intelligence to people they find attractive. 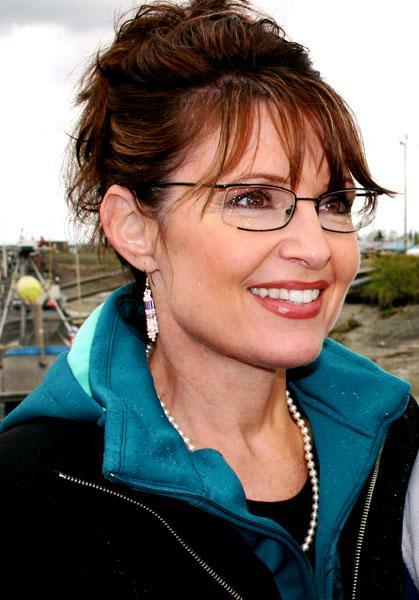 Palin, as a former runner-up in the Miss Alaska pageant, is still attractive at 44, and her “hockey mom” likability is likely what helped her win her own elections. The McCain camp is probably counting on injecting this principle as an attempt to offset what Obama brings to the table in this regard. So, I suppose one can say that they’re pandering to the emotional side of the electorate. -Finally, there is something to be said about what Obama’s selection of Biden did to influence this pick. We may be seeing a bit of political chess being played here, specifically with regard to the upcoming debates. Someone in McCain’s circle probably figured that it won’t be hard for the fiery Biden to appear as a big bully when going one-on-one with the cute female Alaskan governor. In the very least, this dynamic could serve to handcuff Biden in light of how the machine of spin and subsequent perception works. A couple of 5 second clips could be all that is needed to cement this impression, and the opportunity to do so would be something that McCain’s people will be looking for. If you expand on that theme and include treatment from the rest of the Obama camp, the punditry and the broader media, you can see where this might play into their hands. It’ll be interesting to see how it all plays out, but some are already urging their fellow detractors to tread carefully. Also, its conceivable that McCain went out of his way to select someone that wasn’t an opponent in the primaries, thereby avoiding the threat of past criticism and appearances of hypocrisy being used against him as we head towards November. Again, political chess. But do you notice that none of those considerations actually has anything to do with effectively running the country? Say what you want about Biden (I have), but with Obama’s pick, at least one can say that there was more attention placed on the aforementioned (b) and (c), that’s for sure. It’s been pointed out that, given McCain’s advanced age, reliance solely on this rationale is risky (both politically and otherwise). New Republic columnist Peter Scoblic opines that the selection even reveals a certain level of arrogance on McCain’s part. I think he makes a pretty good point. Let’s hope that the rest of America sees it that way as well. Do I return to banished territory as some creatively named sockpuppet? I’ll go ahead and stroll right past special ed this time around. With the Democrat National Convention going on in Denver this week, much has been made out of the effect that the disgruntled Hillary supporters will have on the event, presumably because the drama-loving cable news networks thrive on this kind of thing. I’ve noticed that, sprinkled throughout the coverage, there have been interviews with a few of them, and with each one I can say that I can feel my own IQ level dip a bit. So, to share my pain with the rest of the world, I’m putting together a little montage of the ones I’ve come across. My favorite parts are where she is visibly upset with King for basically being called out on her air-headedness, but then reminds herself to smile as to not appear rattled. King tries to remind her that things like some vitriolic comments on blogs are outside the control of Obama himself and is a pretty weak reason to not vote for the guy, given the fact that Hillary shares the same position as Obama on virtually every issue and his trying her darnedest to convince people like Elizabeth that she needn’t worry. But oh well. Spite wins the day, I guess, and victimhood by association has a new poster girl. Finally, we’ve got an actual delegate at the convention who is quite obviously overcome by emotion, interviewed by Suzanne Malveaux right after Hillary’s big speech. So let me get this straight…oh nevermind. I don’t even know where to begin with that one. “Get a grip” comes to mind. Another thought would be bewilderment on how a Dem delegate could rationalize sitting out the vote for the Dem candidate for president. But there you have it, big ‘H’ t-shirt and everything. I’d like to say that most people would see right through that, but given the collective intellect of the few that I’ve just highlighted, I’m not sure if “Its OK” is all the whiners need to tip them over. Chalk this one up for the ages. The guy who was responsible for bringing the fuel-swilling Humvee to the civilian retail market has recently* come out and thrown his muscles behind something called “EcoDriving“. The Department of Energy estimates that 1.2 billion gallons of fuel were wasted in 2005 as a result of driving on underinflated tires. Tires can deflate naturally, by as much as 1.5 PSI (pounds per square inch) a month. Experts estimate that 25% of automobiles are running on tires with lower than recommended pressure. Fuel efficiency is reduced by 1% for every 3 PSI that tires are under-inflated. So, keeping your tires properly inflated translates into a free tank of gas a year and reduces CO2 emissions too. Check tire pressure at least once a month. The correct tire pressure in PSI can be found on the tire label, as well as on the door frame, sill or edge. If all Californians properly inflated and aligned their tires, we’d save 300 million gallons of gas a year, according to the California Energy Commission. *To be fair, Schwarzenegger has been actively going “green” on his Hummers for quite some time, but when I saw the video on the EcoDriving website featuring the Governator encouraging all Americans to try to better their MPG’s and lower emissions, I figured the irony had come full circle. Since the creation of this blog back in January ’07, a there has been a total of 1,280 hits from netizens entering the search term “chenzhen’s chamber”. You are currently browsing the ChenZhen's Chamber blog archives for August, 2008.